Final 15 films of 2010 to look out for. Have you heard of The American, Legend of the Fist: The Return of Chen Zhen, Buried and RED? Mexico is the new Johannesburg. Write that down. Because you heard it here first. 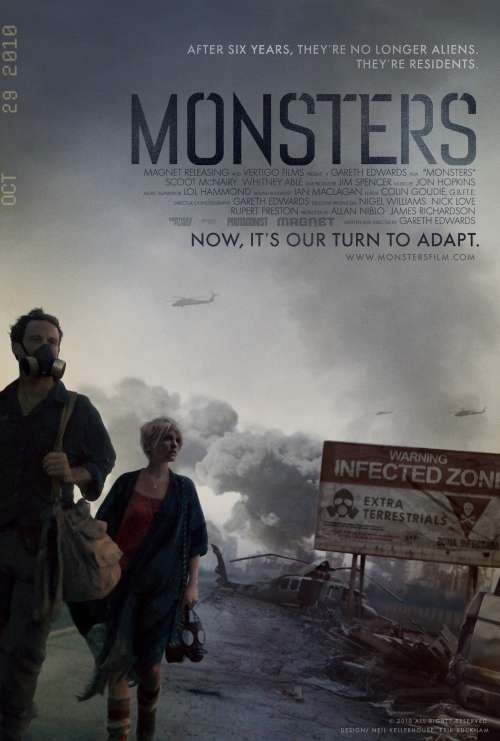 On the surface, “Monsters” may seem like a “District 9” rip-off, with the same basic set-up of alien life settling in a shabby urban environment. But that’s where the similarities end. The former’s benign extraterrestrials are light years apart from the latter’s micro-organisms that rapidly evolve into massive, terrifying, and very pissed off creatures. Produced on a shoestring budget, this British indie effort received rave reviews at film festivals like Cannes and SXSW. Early word-of-mouth is that “Monsters” is a harrowing and often unbearably tense experience. In a good way, of course. I’m praying our Malaysian distributors have the wisdom to release it in theatres. Danny Boyle is one of my favourite directors. Every film he makes has a distinct identity, yet manages to retain that hip, loose and experimental feel that Boyle’s known for. Still, when this project was announced, my first reaction was a resounding “Eh?” Based on the true story of outdoor adventure junkie Aron Ralston, “127 Hours” refers to the amount of time Ralston spent out in the wilderness with his arm crushed beneath a fallen boulder. Being a pro-active sort of dude, he decided that instead of dying out there, he would simply cut off his own arm with a pen knife and hike back to civilization. I’m not thrilled about the choice of actor for this role: James Franco. He’s always come across as a guy who is content to coast along on his good looks. And now he’s in a largely solo outing, no easy feat for even the most accomplished performer. But in Boyle’s hands, this might be something special. I love this movie and have positive review about it even education deals with the benefits of the computer science, in which if the students have gotten the computer science. So they can easy to earn a handsome money for survive in society due to the getting education of computer science.